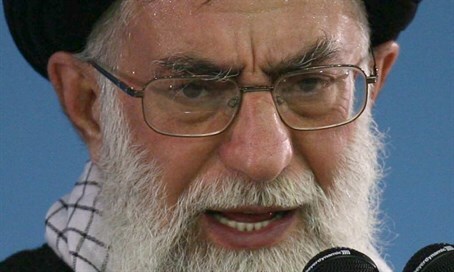 Iranian Supreme Leader calls US, Britain and Israel the 'main enemies,' rejects joining the world economy. Iranian Supreme Leader Ayatollah Ali Khamenei lashed out Friday at the United States, Britain and Israel as the Islamic republic's "main enemies," accusing Washington of procrastinating over the controversial nuclear deal. "It's the US, the evil Britain, and the damned and cancerous Zionist regime. These are the main enemies," Khamenei said in a televised speech marking the 27th anniversary of the death of his revolutionary predecessor Ayatollah Ruhollah Khomeini. Ironically, a report released by the US State Department that same Friday revealed that Iran once again was the leading state sponsor of terrorism in the world in 2015. The supreme leader mentioned the nuclear deal with world powers that came into force in January, and accused Washington of breaking its promises, despite his nation's sanction breaches through ballistic missile tests. "We sat down and negotiated with the P5+1 group and even separately with the Americans over the nuclear issue," he said during a televised speech to thousands gathered at Khomeini's extravagant mausoleum in southern Tehran. Khamenei's address was met with chants from the crowd of "Death to America," a common cry during his anti-Western speeches. "The other side, the Americans, made some commitments. The Islamic republic completed its commitments but the other unfaithful side is procrastinating." "Whoever trusts in the United States is committing a big mistake and will be hit with a slap" by them, he added. After the nuclear deal entered into force in mid-January, some international sanctions on Iran were lifted by the United Nations, the US and the European Union. But the US and EU have kept sanctions related to Iran's missile program, its human rights situation and support for groups like the Lebanese terror proxy Hezbollah, which Washington recognizes as a terrorist organization. Khamenei said it was "impossible" that Iran would enter into negotiations with the US over such issues. "First they enter with a smile and (soft) language but later in practice they will not do what they should do and will not keep their commitment," he said. Iran particularly accuses President Barack Obama's administration of not taking the required steps to reassure big international banks who are reluctant to do business with Iran for fear of punitive measures. Iranian President Hassan Rouhani told Tehran's newly elected parliament last week that Iran needed $30-50 billion (27-45 billion euros) each year in foreign investment in order for it to hit its 8% growth target. Khamenei went on to emphasize the importance of a domestic "resistance economy," rather than reliance on foreign investment. "To think that the economic boom of the country can be merely reached through foreign investment is a mistake," he said. "More important than foreign investment is activating domestic potential. For a country to integrate its economy into the world economy is not an honor, it's a loss and defeat."